YoYoJam was the first company in the world to push the concept of rim weighting to the max. The idea is simple but the equation complex. The more concentrated the rim weight the better momentum and quality of spin your yo-yo will have. With a specific patent on rim weighting a yo-yo no one does it better then YoYoJam and with this new release things are taken to the Next Level. Next Level is a high grade aluminum yo-yo precisely machined and features a completely unique patent-pending finish! A diamond texture covers the body of the yo-yo and takes yo-yo aesthetics to the Next Level literally. Stability off a throw is brilliant thanks to the dense bronze weight rings being carefully placed on the rim of the yo-yo — you will feel the momentum and overall power of its spin. 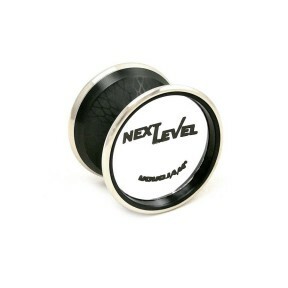 Everything about Next Level is professional and premium feeling. The shape design of the yo-yo was also carefully calculated to be as efficient as possible for today’s high demands. Rim weight is angular and focused and the body is curved towards the gap to ensure that you get a completely unresponsive yo-yo for advanced freestyle play. This yo-yo is all about incredible spin and amazing aesthetics in one incredible Next Level design!